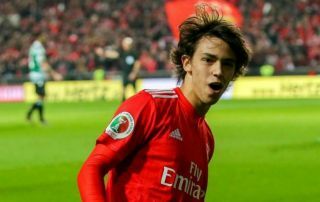 Man Utd and Liverpool could reportedly be dealt a transfer blow as rumoured target Joao Felix could have his release clause increased. As noted by the Mirror, both United and Liverpool have been linked with the 19-year-old, as have the likes of Real Madrid and Juventus. That’s arguably enough in itself to suggest that the teenager has the quality to become a star in the future given the calibre of the interested parties, and he has been busy proving that this season with 12 goals and six assists in 32 appearances across both senior and youth level. Unsurprisingly, Benfica are being tipped to take measures to protect themselves and fend off interest in their prized asset, as it’s reported by ESPN that club president Filipe Vieira has reiterated their desire to increase his release clause. “Right now we are not interested in selling Joao Felix, and soon we will increase his release clause,” he told Tuttosport. It’s added that his current clause stands at €120m, but reports in Portugal have suggested that the club want to increase it to €200m, which will surely all-but end interest in the talented youngster assuming that no club is going to be willing to take such an expensive gamble. While he has shown plenty of promise to this point, that is a lot of money for a player who has yet to prove himself at the highest level on a consistent basis. With that in mind, it could scupper any hopes of a move to United or Liverpool for the time being, but they will surely continue to monitor his progress with a view of making a move in the future if Benfica are willing to sit down and negotiate a lesser fee.